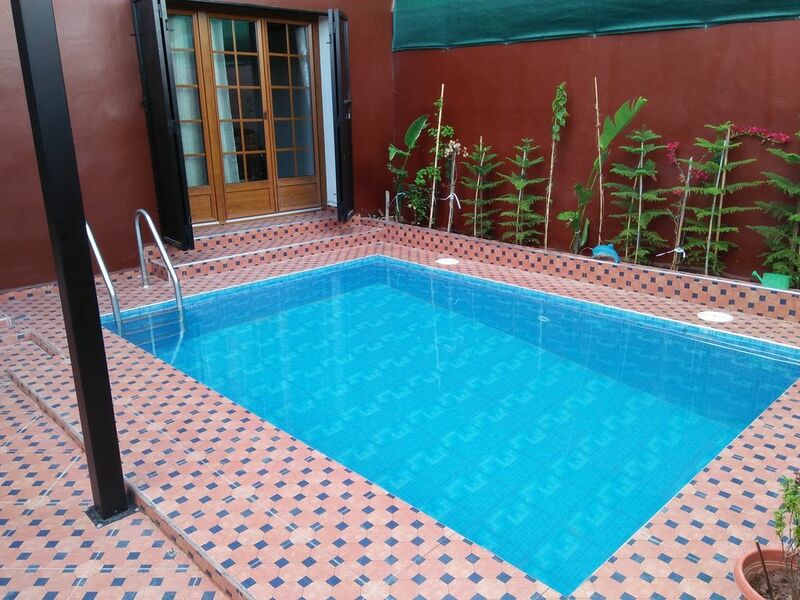 On the ground floor there is a private swimming pool for guests. Next to the pool there are sunbeds and a table with chairs to enjoy the sun. On the ground floor at the entrance there are 2 beautiful living rooms. the first living room is modern. The second living room is traditionally furnished. In the living rooms there are 2 dining table and the kitchen that everyone can use. You do not have to get your hands dirty because there is a cook that you can use from the morning until late at night without any additional costs. On the 2nd floor are the bedrooms. You can choose a room with a double bed or a room with a double bed and extra sofa bed. On the second floor there is also the bathroom with a shower and a bath with jacuzzi. So you can enjoy yourself at the end of the day. Do you want to experience a traditional Moroccan hammam? Then go to the 3rd floor where you can make free use of the Moroccan spa hammam. The villa is located 5 minutes from the center. The taxi is always on the doorstep and takes you 0.50 euro cents to the center of the city. Optional to rent: scooter, car and bicycle.